Connecting The Dots With The Respect Principle’s mission is to transform respect from a discretionary value to a global principle to raise the standard of living and quality of life of all people, aided by original intellectual capital of the concept presented in a diverse range of books, products, and services, plus special events and projects. Your natural confidence, refined skills, and diverse experience result in strong leadership and your understanding of complex issues, including but not limited to financial, empowers you to examine and resolve issues objectively with timely precision. Your high standards and sound work ethic, decisiveness, and excellent organization skills result in competency often recognized as beyond the call of duty. Courageous, bold, yet respectful and compassionate, your character yields cooperative results. An astute, avid learner, you enjoy learning for the thrill of learning, including technology. You have the potential and desire to be one of the three potential vice presidents and limited partners. Our other two teammates will be an operations specialist and business development specialist, all of whom will work closely with the originator, researcher, developer, artistic director, founder, and president, though not necessarily from the same geographical location. After a probation period, limited partner equity will be acquired through salary deduction rather than an upfront cash contribution. Submit a 50 word statement explaining why you want the role and why you would be the best Connecting The Dots With The Respect Principle Social Business ADMINISTRATION Specialist through LinkedIn messaging. If your message strikes the right chord, you will be contacted to proceed further with the interview process. Your interest is greatly appreciated; however, if you are not contacted, please know it is not a reflection of you, but of finding the best fit for the role. Thank you and best wishes! 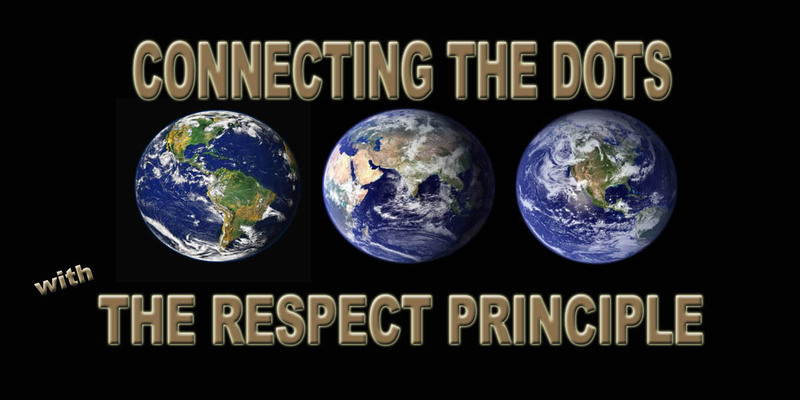 Connecting The Dots With The Respect Principle’s mission is to transform respect from a discretionary value to a global principle to raise the standard of living and quality of life of all people, aided by original intellectual capital of the concept presented in a diverse range of books, products, and services, plus special events and projects. You enjoy keeping busy and getting the work done, the key to success in ramping up the company’s global initiative. Your excellent observation skills empower you to see what needs to be done, and when realistically. Your charming manner makes friends easily, making you a natural leader that creates a fun, active place to work inside the company, plus easily engaging supportive external companies. Being part of a team, whether the company’s management team or your operations team or your external team results from your ability to accept differences and try new approaches to get the job done. You adapt well to change and can shift gears quickly. You have the potential and desire to be one of the three potential vice presidents and limited partners. Our other two teammates will be an administrative specialist and business development specialist, all of whom will work closely with the originator, researcher, developer, artistic director, founder, and president, though not necessarily from the same geographical location. After a probation period, limited partner equity will be acquired through salary deduction rather than an upfront cash contribution. Submit a 50 word statement explaining why you want the role and why you would be the best Connecting The Dots With The Respect Principle Social Business OPERATIONS Specialist through LinkedIn messaging. Being “liked” on social media is nice … however, having a real friend who likes, accepts, and forgives our not being perfect is rare and far beyond just being nice. It is what we all hunger for in a world that is becoming less tangibly real.